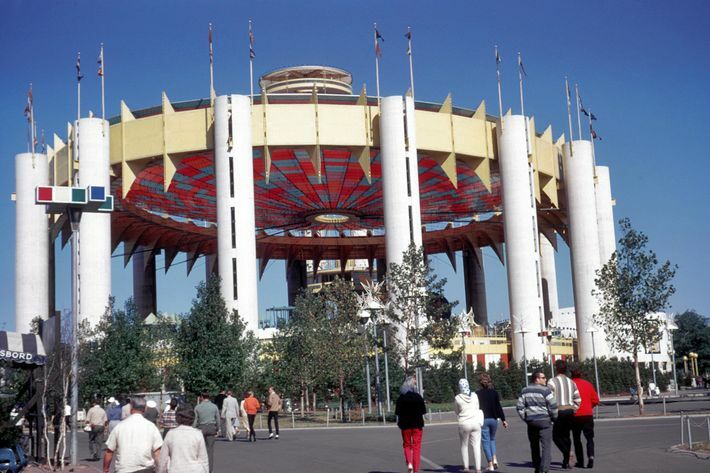 Will a Relic of the World’s Fair Ever Get a Proper Second Life? 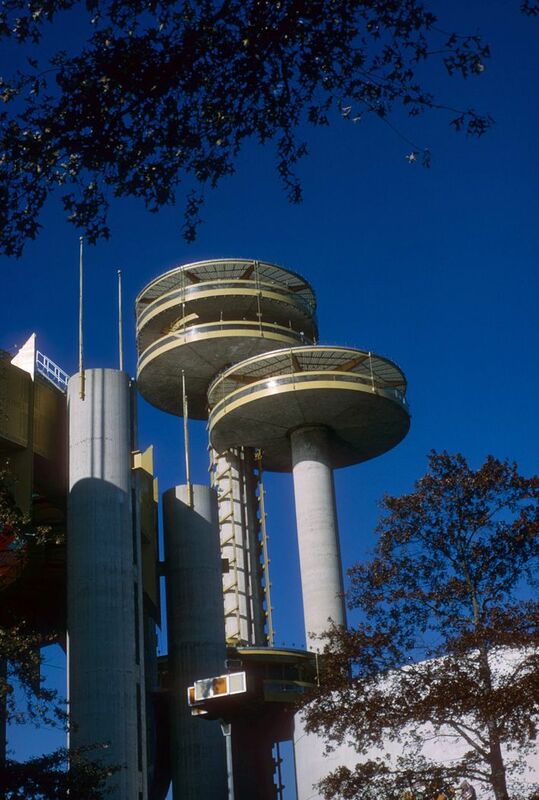 Constructed for the 1964–65 World’s Fair, the New York State Pavilion in Flushing Meadows Park is one of the few buildings still standing more than five decades after the fair’s opening. 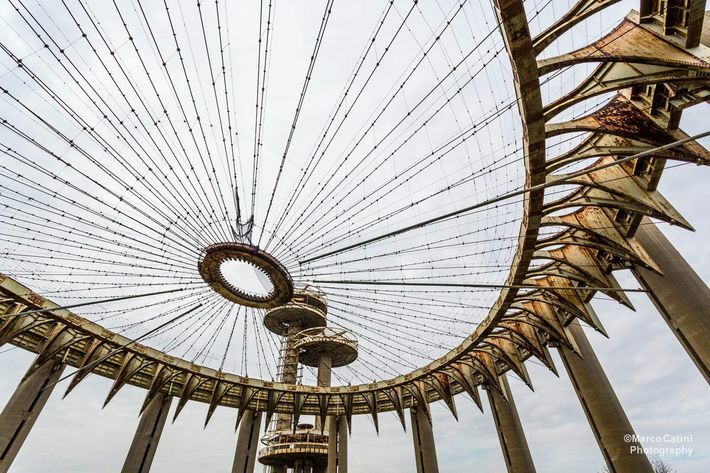 Envisioned by then-governor Nelson Rockefeller as a magnificent symbol of the state’s strength, the Philip Johnson–designed pavilion was a favorite of Robert Moses, and was one of the few structures that Moses wanted to remain after the fair ended. But after a brief second life as a roller-skating rink, the pavilion was left to decay in the elements, and what remains today is a battered shell of its original design. Matthew Silva, a 29-year-old Long Island teacher who was born in Queens, hopes that will change. 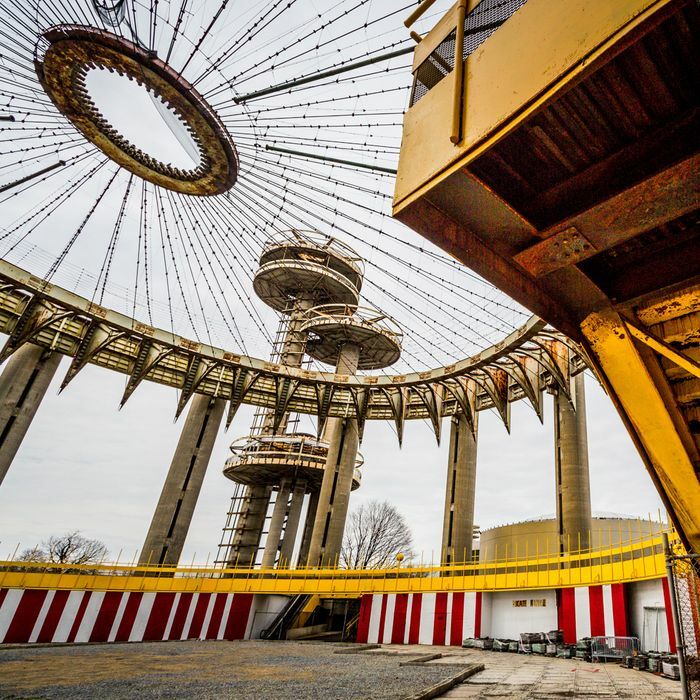 He’s made a documentary, Modern Ruin, that premieres tonight at the Queens Theater and traces the pavilion’s history while looking at its future potential. He’s also co-founded an advocacy group called People for the Pavilion that hopes to raise awareness of the structure. 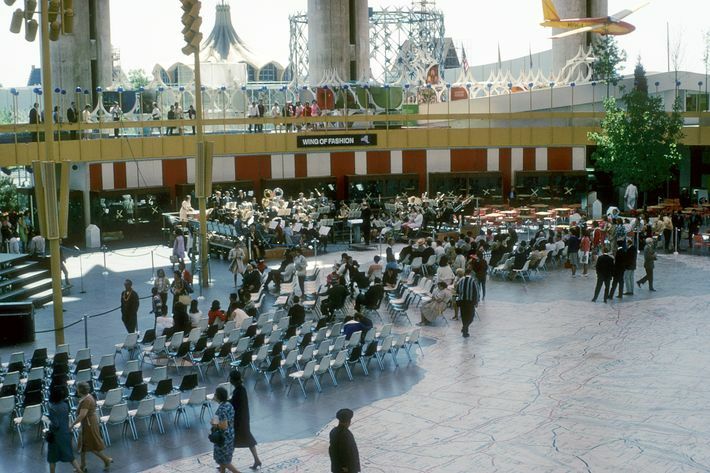 During the fair, the elliptical Tent of Tomorrow was used as a versatile performance space, while the adjacent towers served as an observation deck and VIP area. But not much has been done to preserve the structure since the fair ended in 1965, and it’s been deteriorating for decades. For a time after the fair, it was maintained while being used as a roller-skating rink, but since then it’s received only minor attention, usually in the name of public safety. 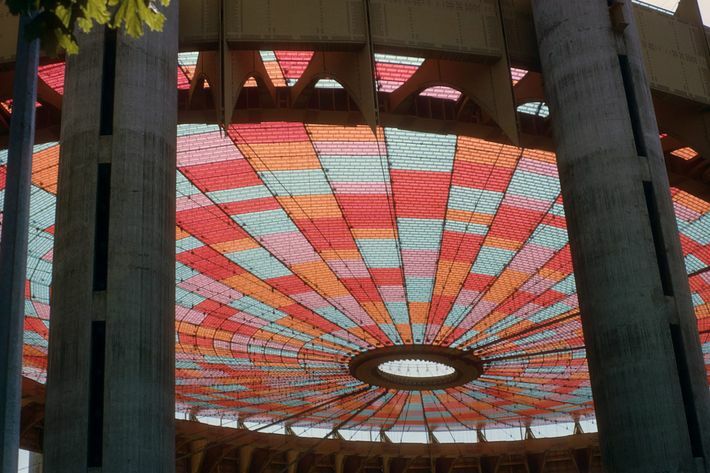 The tent’s colorful fiberglass roof was long ago taken off, and the SkyStreak elevator pods, unusable after years of neglect, were removed in 2008 and simply left at the bottom of the towers behind a chain-link fence. The most significant upgrade in recent years was a grassroots effort by volunteers to re-paint the base of the Tent of Tomorrow in time for the fair’s 50th anniversary in 2014. 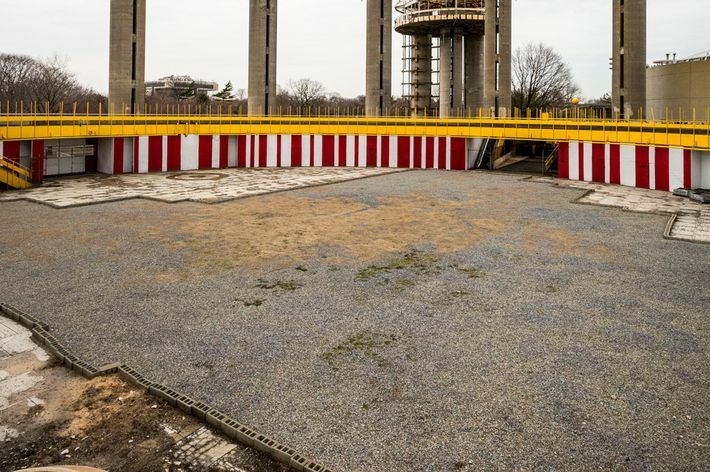 Last year, Queens borough president Melinda Katz secured nearly $6 million in funding for the pavilion, which is meant to go towards stabilizing the structure — a process that is estimated to cost some 40 or 50 million dollars. And it’s set to get a paint job this year, at no cost, as part of a training program for apprentice bridge painters. But the bigger question remains: What should actually be done with the pavilion in the future? At the moment, there are no formal proposals, and Silva admits it’ll be hard to raise funds without one. But he hopes the film, as well as his advocacy group, will get people thinking about what can be done. “Our organization is trying to get people to learn about it, and to see it in a different perspective,” he says. He compares it to Manhattan’s High Line, and hopes the local community will brainstorm potential uses. “It’s an exciting design problem,” he says. Silva says there’s enough history embedded in the pavilion’s bones to remind people of its original use. “I’m not in it for nostalgia,” he says. There is one thing he’d like restored, though: The huge terrazzo map of New York state that took up much of the floor of the tent. It’s been badly damaged over the years, but most of it is currently preserved in its rundown state under layers of tarps, sand, and gravel. Down the line, Silva envisions a public-private partnership for the pavilion, that could raise money and formally solicit ideas for its future use. 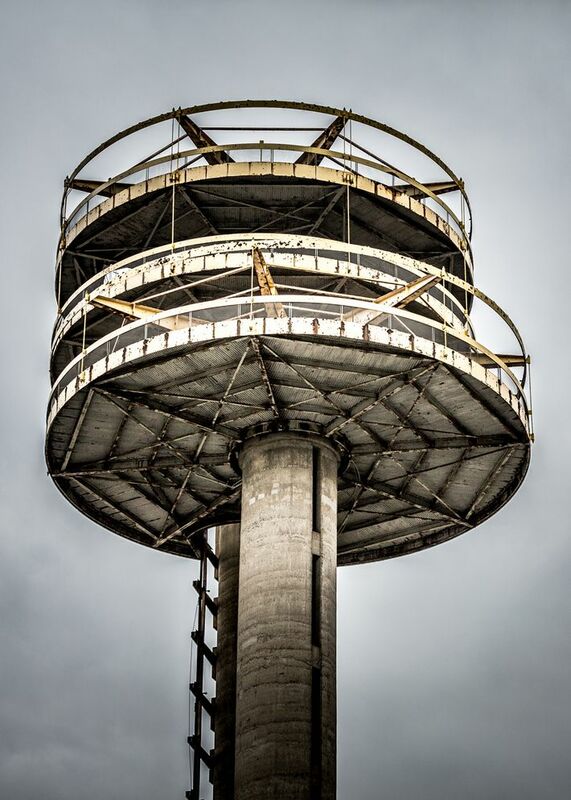 But for now, he’s just hoping to build a coalition of people to rally around a structure that’s best known to many younger New Yorkers for housing an alien spaceship in the movie Men in Black. “If something new and fresh could come in, it could be very cool,” he says. 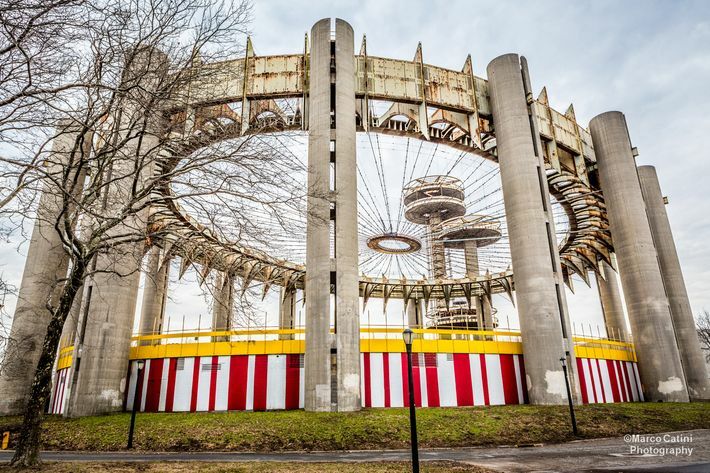 Will This World’s Fair Relic Get a Second Life?